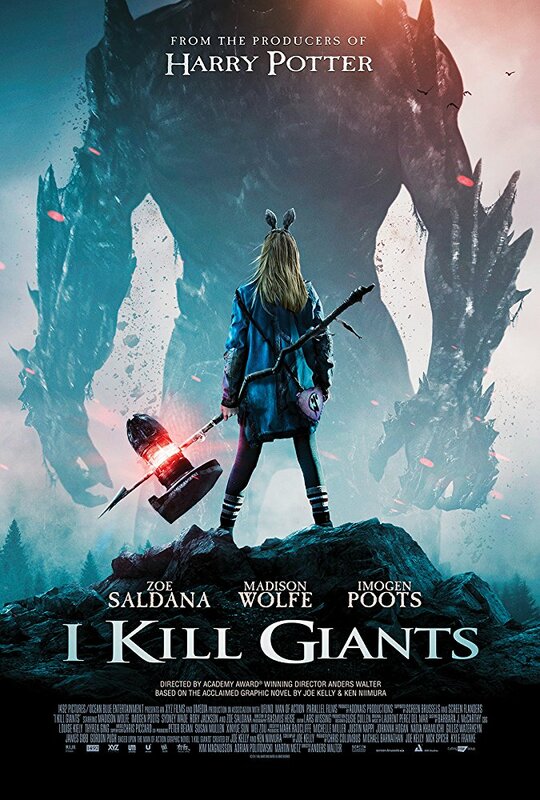 I Kill Giants (2017), NR, 1h 46min - This film is a live action adaptation of the 2008 Image Comics series of the same name, created by Joe Kelly and JM Ken Niimura. 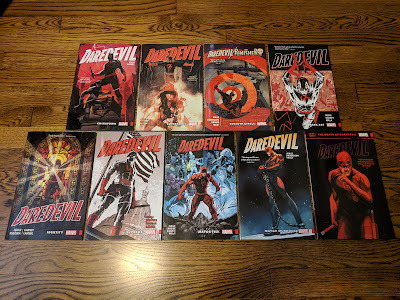 It was a series that I had long heard great things about, and one which I was happy to have finally gotten the chance to read this past week. This weekend marks the film's initial, limited, theatrical release - meaning it won't get to my area for at least another week or two - however, thanks to its simultaneously being available to rent digitally through Amazon Prime, I didn't have to wait, and I'm happy to report that this is a pretty worthy adaptation. 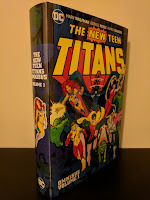 I gave a vague overview of the story in my review of the graphic novel yesterday, and I will attempt to do the same here: I Kill Giants is the story of Barbara Thorsen (Madison Wolfe), a nerdy, sarcastic, introverted, middle school-aged girl, using her imagination to simultaneously avoid and cope with life's problems while interacting with others as though she were in the middle of a Dungeons and Dragons campaign. Her mother (Jennifer Ehle) is sick, her brother Dave (Art Parkinson) thinks her gaming is childish, and her older sister Karen (Imogen Poots) is the family's sole provider, struggling to make ends meet. Her only friend is Sophia (Sydney Wade), who just moved to the area and doesn't know anyone else. They bond in part due to being mutual targets of the class bully, Taylor (Rory Jackson). Barbara's blunt, sometimes downright rude ways of interacting with others lands her in Mrs. Mollé's (Zoe Saldana), the school psychiatrist's office. As Sophia and Mrs. Mollé begin to get to know Barbara, they realize that her constant talk of giants isn't craziness, but her way of dealing with something much more real. 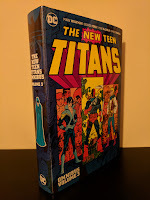 The original comic series was relatively short - just seven issues - so I was curious how well it would translate to an hour and forty five minute long movie. Creator Joe Kelly was actually the film's screenwriter as well, so the story told here is actually quite faithful to the source material. Kelly takes advantage of the opportunity of re-visiting his characters to further illustrate the budding friendship between Barbara and Sophia, showing a bit more of Barbara's tracking and hunting of giants as she takes Sophia under her wing. The cast is relatively small, focusing on just a handful of characters, but they are all portrayed wonderfully. Madison Wolfe, Zoe Saldana, Imogen Poots, and Sydney Wade really embodied what I was expecting from Barbara, Mrs. Mollé, Karen, and Sophia having recently read the comic. There are some really great interactions between the four that draw you in, make you care about these characters, and helping to provide the emotional impact of the later parts of the story. This film is also the feature length debut for director Anders Walter, who had previously won an Academy Award (Best Short Film, Live Action) in 2014 for Helium. All in all, I Kill Giants is a very good adaptation of Joe Kelly's and JM Ken Niimura's original work. I feel like the final confrontation could have been a little more elaborate (as it was in the comic), which would have added even more to the emotional pay-off. Admittedly, that thought may be unfairly influenced by my having just finished the source material two days ago. Either way, I definitely recommend I Kill Giants in one form or another (although I think I prefer the comic myself). If you're interested in this film, but don't live in an area that saw its limited theatrical release this weekend, you can check it out via Amazon Prime as I did. I enjoyed it enough that I'll likely give it another watch in the theater once it comes to my area. It never hurts to support smaller films such as this, especially well made ones.